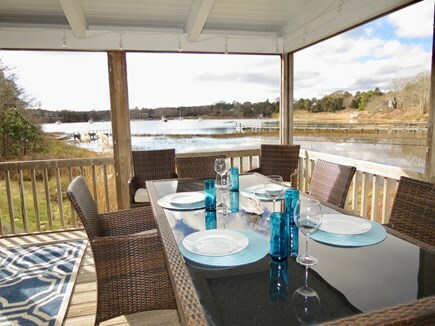 Dining with a water view, whether inside or outside. Large dining table will seat everyone comfortably. 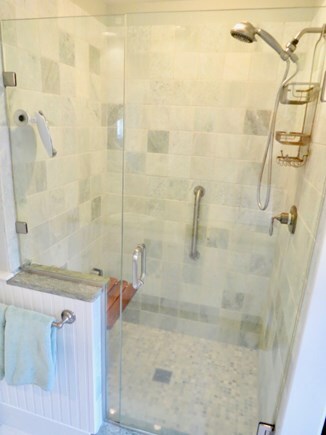 Another beautiful full bath. 2.5 baths in all. Lower level has a sleepm sofa and trundle bed -- plus ping pong! 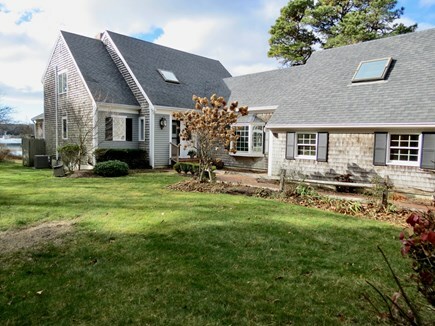 Classic Cape home, but with upscale modern conveniences. You'll never tire of the view of Ryder's Cove. RATES Reduced up to $750 for select remaining open weeks! The new Massachusetts state and local taxes apply to stays starting July 1 or later. Book in June and save! 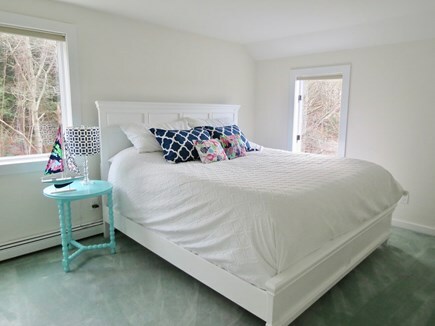 Welcome to this recently renovated Chatham home with Ryder’s Cove in your back yard. Sit and relax on the dock and dangle your feet in the salt water. Or get active and swim, kayak, paddle board, or fish in the calm protected waters of Ryder’s Cove. It’s a quick paddle over to the Pleasant Bay beach. 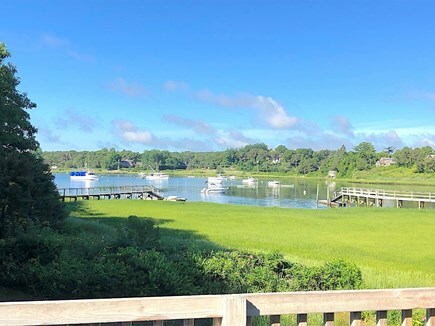 Or simply enjoy the sweeping views of the Cove’s picturesque moored boats from the privacy of this quintessential Cape Cod property. You are facing west here, so look forward to stunning sunsets. Sandy Jackknife Beach is a mere three-minute drive away and is great for swimming, boogie boarding or riding the ''lazy river''. Eastward Ho! Golf Club is also a short 1/2 mile away - a beautiful spot for a walk, run or bike ride with views of the golf course and Pleasant Bay. And it’s just nine minutes to Main Street, Chatham Village, with all its appealing shops, restaurants, galleries and entertainment, including Cape Cod League Baseball and a retro style movie house, complete with a wine bar. Inside, the main level of this home has been thoughtfully planned to make the most of the Cove views. The open, social kitchen has been recently updated with high-end stainless steel appliances and granite countertops. 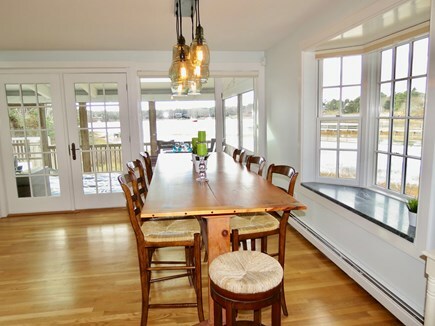 The spacious kitchen island has highboy counter seats and two dining tables which seat up to twelve. 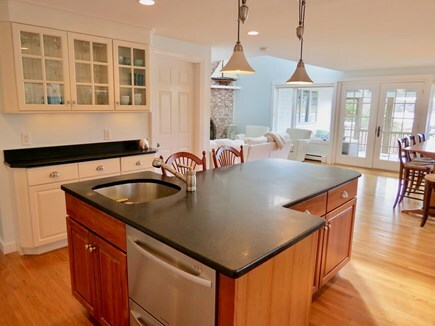 This kitchen is fully equipped for a clam bake, lobster dinner, or to prepare the fish you catch in the Cove. The soaring vaulted ceiling lends a sense of space and light to the generous great room with comfortable lounge seating and flat screen TV. 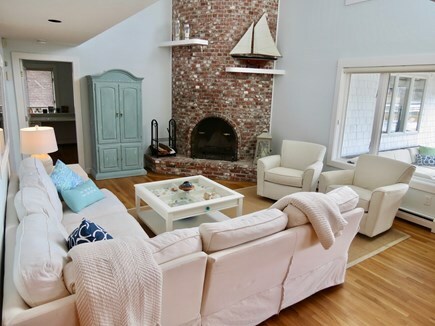 This room is visually dominated by the towering two-story brick fireplace and chimney and has beautiful water views from every one of the oversized windows. 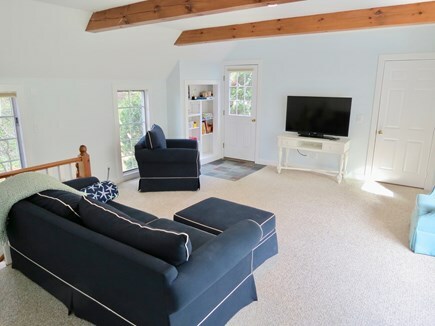 From the living room you walk out to the large screened porch with captivating views of the Cove and stunning sunsets. Out here, there are skylights and a large dining table for entertaining or a family dinner. After the sun sets, turn on the twinkly white lights and get cozy in the comfy couches or enjoy the rocking chairs and outdoor gas fire pit. Just outside you’ll find the gas grill for those wonderful summer cookouts. Another gathering place, especially ideal for children, is the “kids’ den,” with a bigger flat screen TV and couches. Plenty of room here for kids to spread out, apart from the adult living spaces. 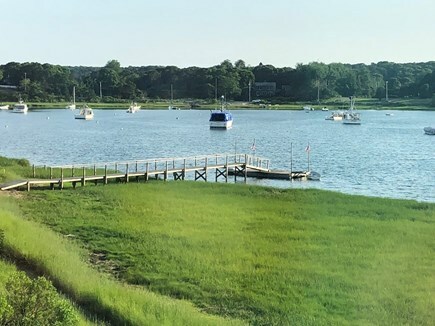 If you’re spending the night in the first floor master bedroom, you’ll awaken to a beautiful view of the boats in Ryder’s Cove. 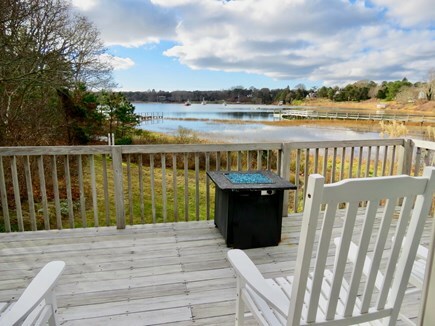 Brew a cup of coffee and plan your day while relaxing in the rocking chairs on the deck overlooking the water. The master suite includes a comfortable king bed, office area and private full bath en suite. 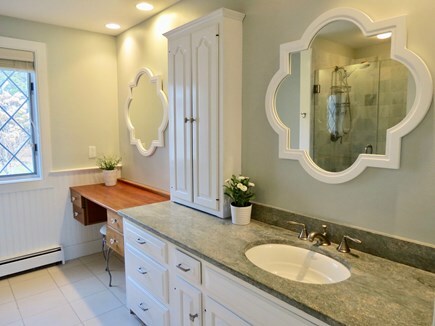 Also on the main level: the half bath and laundry area. 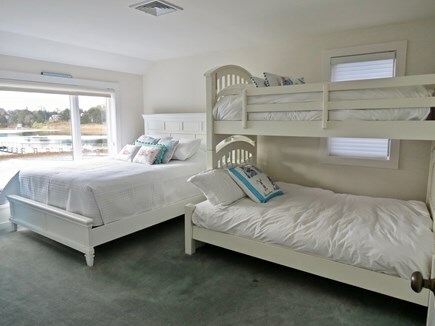 The second floor offers two bedrooms, one with a queen size bed plus twin-over-full bunk beds. While you can see the water from either upstairs bedroom, this one has the better view. The other second level bedroom has a roomy king size bed. These two bedrooms share a full bath. You’ll find living space on the lower level as well, including a ping pong table, TV, couch and a twin bed with pull-out trundle under. This home is on a quiet cul-de-sac and is fully air conditioned, offers cable TV and high speed Wi-Fi. 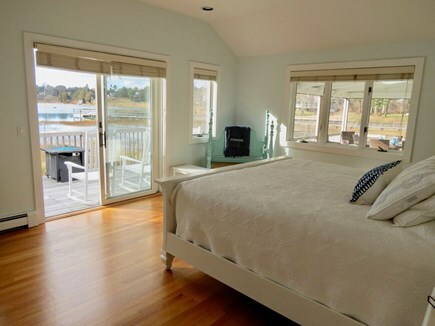 The thoughtful owners also provide a 2-person kayak and a stand-up-paddle-board for their guests’ use. And the quiet waters of Ryders Cove provide the perfect place to get the most enjoyment out of them. Please enter your travel dates in the top right corner of this page for up-to-date pricing. This property has a seven-night minimum during the peak season. As is customary in vacation rentals there are additional fees to the rates listed. Those fees include $115 reservation fee and an $50 non-refundable Accidental Damage Protection (ADP) fee. In addition, there are state and local taxes applied to all reservations less than 31 days in length that total 12.45%. This property offers a 3-night minimum stay during select weeks in September – November. Guests are charged a cleaning fee for all stays less than 7-nights. Stay 7-nights or more and the cleaning fee is waived.